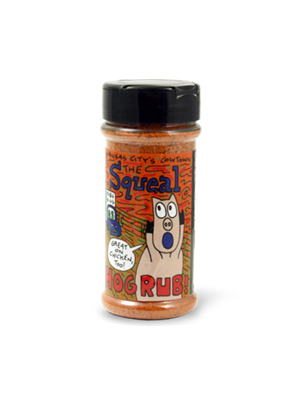 The Squeal rub is the seasoning that helped win the American Royal Bar-B-Q contest twice! Coat your hog or bird with this magic powder and prepare to munch! 6.5oz. Salt, dehydrated garlic and onion, brown sugar, paprika, sugar, spices, disodium inosinate and disodium guanylate, natural hickory smoke flavor.